Hello! Anybody else run a turkey trot on or around Thanksgiving? I did. And let me tell you, I raced that sucker like I have never raced a 5K before. It was freezing -- literally. Check out this picture pre-race of me and my friend. It was the coldest Thanksgiving in 13 years. I was wearing my hat, a long tank bra, a long sleeved running shirt and my half zip. And I was just warm enough. I've often said I'd rather race a half marathon than a 5K. 5Ks, at 3.1 miles, are all sprint. I am much more of an endurance athlete: I usually settle into my good running rhythm around mile 3, which is when the 5K ends. So warming up is key for a 5K where I don't want to die immediately. This race was great. It was fast and flat, and I mean it: it was fast ... and it was flat. No hills. And it was a fun course through pretty neighborhoods and was well marshaled. The course was crowded in the beginning. It started 15 years ago with 21 runners and has evolved and grown to have nearly 700! But it was fun, well organized and well done. 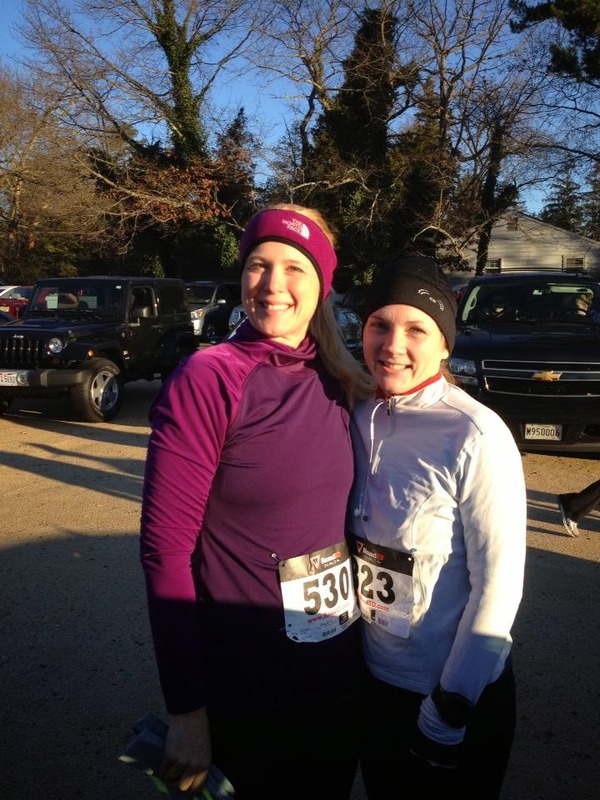 My prior best time for a 5K was 25:39 (8:16 pace) just last December at a New Years Eve 5K. It was also cold that day - probably colder than the turkey trot. So for this race, my goal was to run it at a pace in the 7s. I didn't care if it was 7:59:99. I just wanted to see a 7 as my pace. I've been doing more speedwork this year, so I thought I could do it. And I did. My time was 23:15, which is a 7:29 pace. Please indulge me and let me repeat that: seven minutes twenty-nine seconds per mile pace. That is crazy. Crazy like a fox! A fox who is insane! And I geeked out even more when I realized that I was 64th overall of 620 runners and 12th of 334 women. YEAH!!! I absolutely ran to the beat of the songs, which I think helped me run faster. I will say: running at this pace was hard. It was work. There were a few moments where I kind of wanted to die or hurt people or even small animals. But I pushed hard and made it. I never, ever, thought I could run a race where my average time was in the 7s. Let alone mid-7s. Woo to the turkey-trot hoo! Have a wonderful weekend! It's my birthday on Sunday. And I will celebrate with cake and fried chicken as is my most favorite tradition.